Shortly after posting this gallery of juvenile Short-billed Dowitchers I was back on the East Pond of Jamaica Bay and had perhaps the most cooperative dowitcher ever decide to forage to within five meters. I like these pictures even more than I like the stuff from the gallery. So, rather than beat around the bush, here are three more shots of Limnodrous griseus. This post has been submitted to Bird Photography Weekly #104. Go check it out! 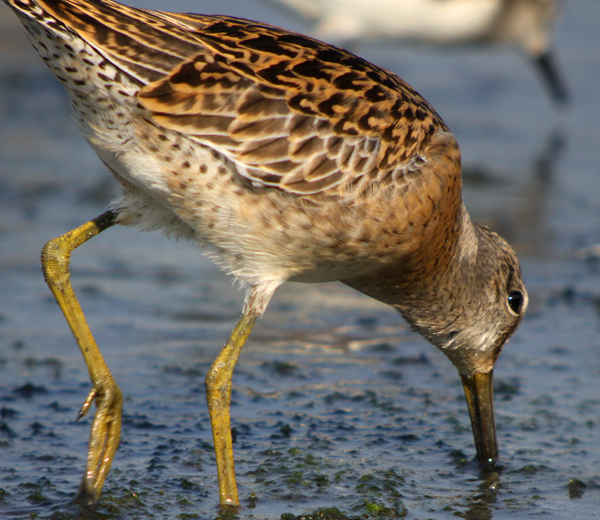 Beautiful shots of the Dowitcher. I have seen plenty of Dowitchers but seem to keep missing the Common Snipe. Thanks for the info. @Eileen: Thanks! Snipes can be tough to find. I would recommend wet roadside fields in early spring as the most likely place to find them on their migration. Sometimes you can get lucky and see a whole bunch at once! And though I didn’t mention it above, I should have reminded folks that the snipe in North America has been split from the snipe in Europe, so the North American one is now called Wilson’s Snipe. I had just happened to look up that the New Oxford American Dictionary — the one built into recent Macs — lists “Dowitcher” as “ORIGIN mid 19th cent. : from Iroquoian.” I had thought that was neat because I don’t know any other words (that is, not place names) derived from Iroquoian. 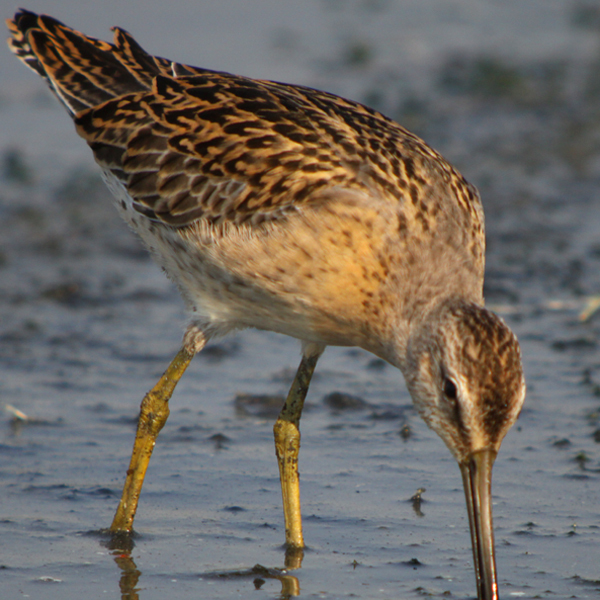 Awesome shots of the Short-billed Dowitcher Corey. It looks like you must have been laying on your tummy for those. Excellent angle. Strangely, there is only one accepted record of a Short-billed “Deutscher” / “Duitser” from Deutschland/Germany, dating waaay back to the 80s. There have been a number of Long-billeds though. 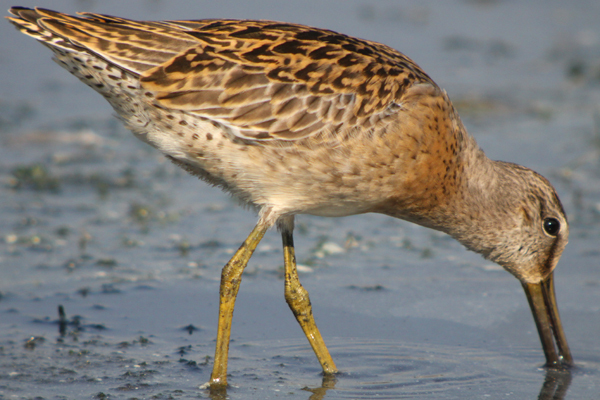 Indeed some beautiful closeup photos of the Short-billed Dowitcher. Great work Corey! These are great close ups on this bird. He’s a beauty. @Chris E and Rick: Isn’t word derivation great fun? @Larry, Bob K, MaineBirder, and Halcyon: Thanks! @Jochen: Well, you better get out looking then. Nice shots & interesting factoid! And raining? Yea a lot.